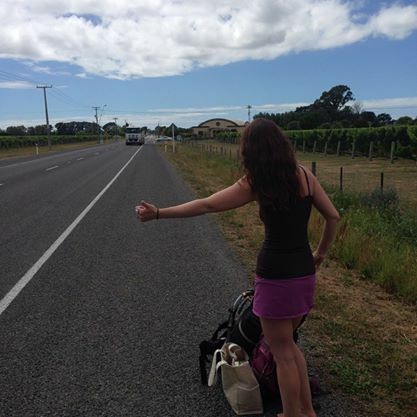 I’ve been hitchhiking around the North Island of New Zealand, mostly because my budget is minuscule. Inter-city buses are expensive if you don’t book them significantly in advance, which I am incapable of because my M.O. is to fly by the seat of my pants. Ride #1: I’d almost given up hope of getting any ride down the hill in sleepy Whakapapa village. A woman from the Department of Conservation finally picked me up on her way to Okahune, and she told me I’m the first woman hitching alone she’s picked up in two years. She was proud of me. Ride #2: After having my thumb out for less than 60 seconds, a big white truck stopped. About 30 minutes into our conversation, this healthy-looking 25-year-old told me told me he’d had brain surgery for a tumor and had restrictions on his license. He also told me he never picked up hitchhikers and that he’d actually pulled over to check his emails. Oops. Ride #3: Stopped right before I had to walk up the huge hill out of Taihape, thank god. He worked for the biggest security company in the world and trained with the FBI. He taught me how to tell if people are lying and to take photos of the licenses of cars I ride in. And then he told me he’d had a brain tumor and wasn’t allowed to ride his motorcycle anymore. Ride #4: Picked me up while on duty to deliver car parts in a beater car – but he has a $7,500 mountain bike. Priorities. Ride #5: Took me the last two hours to Wellington, and told me stories about being the head chef on an Antarctic base, being in a tiny bi-plane over Ruapehu when it erupted, and running a fishing lodge on Lake Taupo – and then took an incredibly boring conference call in the car. He also gave me doorside service to a Wellington hostel – finally. – Kiwis are great about picking up hitchhikers–because they all used to do it themselves and like to balance out their karma. – A camper van will likely NEVER pick up hitchhikers. Even though they have more space than anyone else. Bastards. ← Don’t Follow Your Dreams. Chase Them. okay, yes! this is exactly what i want to know about. whoohoo! i’m proud of you, cass! i love hearing you use the word “we” when talking about hitchhikers! Thanks, lady! Can’t wait to adventure with you down the road! You are a brave chica! We love and miss you and glad you are out there adventuring! Stay safe! Very cool that you are travelling and hitchhiking alone! 🙂 Not sure I would have the guts to go hitchhiking alone. Seems like people like talking about their tumors in NZ:) Good travels!